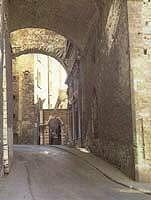 The picturesque Via Maesta delle Volte runs downhill towards Piazza Cavallotti, between the 16th century Palazzo del Seminario and the Palazzo Arcivescovile in Piazza IV Novembre. At the beginning of the street there are still the remains of a vaulting that supported a hall of the Medieval Palazzo del Podestà, destroyed by fire in 1534. A little further, a small red and white striped arch is all that remains of the gothic portico of the 14th century Maestà delle Volte oratory. This was replaced by a Renaissance whose 1590 facade is still in place. Now a religious vestment shop, the interior is decorated with a fresco of the Madonna dated at around 1330. Opposite, a simple door leads downwards into a cellar with a brick barrel vault, now a characteristic woodworker's studio. After passing the remains of the vault at the beginning of the street, there is a broadening that gives onto a fountain built in 1927, in Medieval style. Its rear gives onto a typically Medieval structured courtyard.